The article certainly is attention grabbing, but we at RDG want to highlight the aspect of this article that is of immediate value to those companies with nothing fraudulent to hide, but who share the perfectly reasonable desire to stay out of the SEC’s search lights. Happily, this is also a thing that is completely within the control of companies themselves: Taking steps to ensure your XBRL data is of the highest quality. Almost as an afterthought, Morgan and Feldman write that “one weapon in the task force arsenal is the much-discussed Accounting Quality Model (AQM), colloquially known as RoboCop. The SEC describes AQM as a quantitative analytic ‘model that allows us to discern whether a registrant’s financial statements stick out from the pack.’” What they do not mention, however, is that the RoboCop uses XBRL data as the first line of defense in its search for outliers. For those companies with nothing fraudulent to hide in their books, we like to think of investigation by the Financial Reporting and Audit Task Force as analogous to getting audited by the IRS when your taxes are properly paid but your From 1040 was filled out incorrectly. The IRS will find nothing amiss after the audit, but the process will be awful, time consuming, and expensive. This idea applies to your XBRL data. If your financial statements are in good order, but your XBRL is improperly built, the RoboCop may highlight your company as a candidate for further investigation. By ensuring your XBRL is of the highest quality possible, you can avoid any flag that the Accounting Quality Model RoboCop system might have otherwise raised. We at RDG can help any SEC Filer who wants to know that their XBRL filings exceed SEC validation requirements, and will be in line with the enhanced standards, protocols, and guidelines already put forward by the FASB, the AICPA, the US-GAAP, XBRL-US, and others. 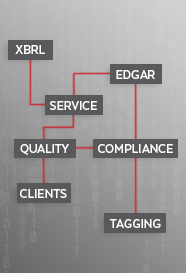 RDG offers exhaustive XBRL Quality Assurance Services, and we have the knowledge, expertise, and experience to ensure that your XBRL documents are not vulnerable to the AQM-RoboCop and any future analysis tools deployed by the SEC.